Sweep away your blues with the ultimate blue topaz gemstone ring. This marvelously crafted solitaire gemstone ring is given the Apples of Gold high quality guarantee. The ring features an exquisite blue topaz gemstone that measures 6mm, 7mm or 8mm, making it the perfect size to grace her finger. The rich azure color of the stone evokes the feeling of a sky-blue day, and the round cut of the gem gives off all the shimmer of the sun with its well-placed facets. The band of silver makes for the perfect complement to this stunning blue topaz stone. 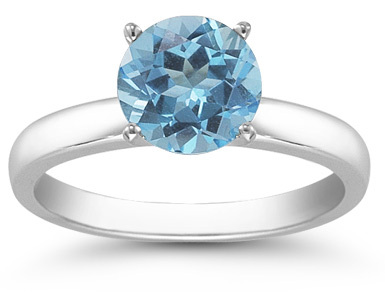 We guarantee our Blue Topaz Solitaire Ring in Sterling Silver to be high quality, authentic jewelry, as described above.